Contact Boat Owner Blaine 928-776-2488 OR Rosemarylmurray@gmail.com Immaculate condition, loaded with upgrades, recently restored with new bottom and Interlux paint and protection system, great for single-handed sailing, racing and cruising. Inspected, marine survey completed in 2010, met and exceeded all strict structural and safety requirements, and certified as a licensed charter sailing craft by the Michigan DNR in 2008. 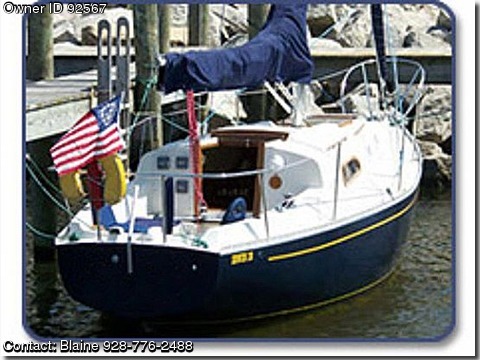 Used lightly for captained-only sailing charter August-October 2008 by previous owner. Used lightly by myself for one year on Lake Huron. Builder Irwin Yachts, Designer Ted Irwin Displacement 7,800 lbs. Ballast 3,000 lbs, Bridge Clearance 40'3" Engine Volvo Penta 15 hp Gas, Model MB10A Tankage Fuel 24 gallons, Water 45 gallons Accommodations Sleeps up to five with forward V-berth, two berths in the main salon, and an aft quarter-berth. Has a very clean interior with 6' headroom.. Salon features drop-leaf dining table, carpeting, head with a porta-potti no pump-out fees. New-ish 2008 curtains and matching pillows. Screens for companionway entry and new 2010 California style Dodger.Please call or email for complete specs.